This is a tremendously enjoyable book; reading it feels like going for a stroll through Old Peking with a companion who is a cross between Peter Hopkirk and Mark Twain. On the very first page of the book, Aldrich lays out his stall with an explanation of the use of “Peking” throughout the book, and in so doing gives us a good taste of his irreverence, passion, his deep knowledge and humour. “Peking” is a far more evocative name that reaches back through the centuries and conjures images of China’s majestic culture. Nor does “Beijing” lend itself to a more accurate pronunciation of the capital’s name by foreigners, who slur the “j” and wind up producing a grating sound like “beige-zhing,” a city not yet identified in China. 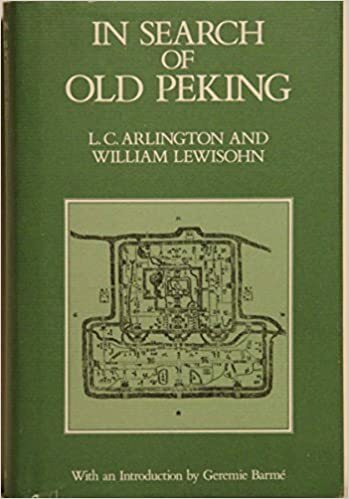 Aldrich, an American lawyer who describes himself as an “unreconstituted, unrepentant traditionalist,” would like to see a revival of the name “Peking.” This is unlikely I think; just look at the “Beijing” in the title of the book. The author explains that this was a concession to modern readers, especially younger ones, who might not be familiar with the old name. Personally, I believe that anyone unfamiliar with it deserves a good public flogging and is not worthy of consideration. I suspect that the publisher preferred “Beijing” (I assume it works better in internet searches) and book titles are, at the end of the day, the prerogative of the publisher. The book has a logical layout. We get introductory topic-based chapters on Peking’s urban design, traditional religion, and history. After that, chapters are arranged by geographical sections, starting with the heart of the city, Tiananmen Square. These earlier sections can be done on foot, ideally with book in hand – there are maps and pictures to help you get your bearings. Later chapters take the reader further afield to the outer suburbs and beyond the city to the western hills, the Ming Tombs, and the Great Wall. The book ends with short chapters on food, drink, and Peking opera. With nothing to lose, I decided to follow in the footsteps of Arlington and Lewisohn during the elusive commodity called spare time. With effort, and admittedly perhaps a touch of romantic eccentricity, I found that, for a moment or two, I could force the concrete apartment blocks to yield to Old Peking. The result of Aldrich’s wanderings and research, The Search for a Vanishing Beijing, is a fitting tribute to the original book and to the city. It certainly fulfils the author’s wish to give “voice to the ghosts of Old Peking.” There’s a nice blend of the modern and old, reality and remembered – what can be seen today and the stories behind that. There’s also a nice balance of the minor and obscure found in the nooks and crannies and the must-see attractions. Aldrich warns that the “book is not meant to be a ‘serious’ work about Peking,” and that he doesn’t attempt to “sift fact from legend or make any new contribution to a body of scholarship.” Instead he says, he has “simply gathered miscellaneous stories recorded over the centuries and set them out alongside their original stage sets.” It’s true to some extent in that you won’t get the latest revisionist history, but don’t let Aldrich’s modesty give the impression that this is a light, shallow work. Though readable, it’s densely packed with information drawing on a vast array on sources, and the kind of book which rewards rereading with fresh nuggets. I haven’t used the book in the field, nor do I know Beijing well enough to comment on how it stacks up as a practical guide, but it has received praise from knowledgeable residents such as Steven Schwankert and Michael J. Moser. And regardless, it works perfectly well for armchair travellers. There are two ways to avoid the crowds, though neither is foolproof. I prefer to visit the Forbidden City during the coldest days of December when the winter light deepens the sang beouf red hue of the walls and the gray of flagstones. In the alternative, a mid-afternoon start will enable you to visit a portion of the palaces as the crowds thin out. I strongly recommend that you bring along a well-chilled half liter bottle of Kuei Hua Chen Chiew, a sweet local wine, and sit under the western wing of the Meridian Gate some evening as the moon rises in the east. While the shadows extend across the flagstones and Peking settles down to evening song, a tipsy traveller can be lost in thought and float several leagues above earthly matters. The Search for a Vanishing Beijing was published in 2008 by Hong Kong University Press. Unfortunately, as is common with academic publishers, the book is not priced for maximum readership. Looking at Amazon, I see the Kindle edition is more expensive than the paperback, $28 compared to a reasonable $22.64. While on the subject of publishers, I can’t help but add a tangential note regarding a connection between Vanishing Beijing and its inspiration, In Search of Old Peking, published in 1935 by Frenchman Henri Vetch. Vetch stayed on in Beijing after the Communists came to power in 1949. However, in 1951 he was arrested for his supposed involvement in a plot to assassinate Mao Zedong during October 1 national day celebrations in Tiananmen Square by firing mortar shells. The accusations made against him and others were entirely fabricated and ludicrous, and would have been funny had the consequences not been so deadly. Vetch, then aged 53, was given a ten-year prisoner sentence. Two friends, Italian merchant Antonio Riva and Japanese bookseller Ruichi Yamaguchi, were executed by firing squad. After three years in prison, Vetch was deported. He took up residence in Hong Kong and helped establish and run the Hong Kong University Press until retiring in 1968. 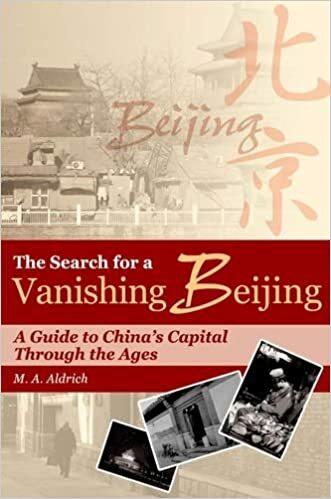 The Search for a Vanishing Beijing can be purchased from Hong Kong University Press or online from Amazon.com and various other retailers. 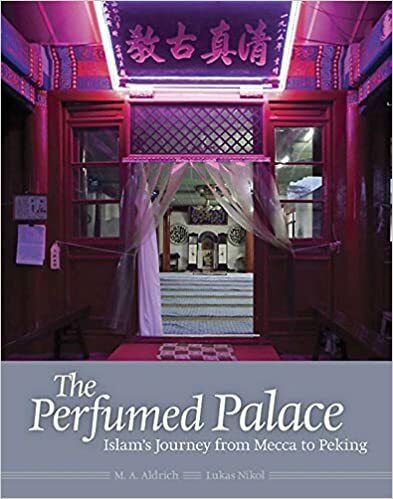 Michael Aldrich is also the author of The Perfumed Palace: Islam’s Journey from Mecca to Peking.